MACD Scalping System is based on short time frame. The reasons will be obvious to you soon. It is actually based on using 1hr time frame using the MACD (12,26,9) indicator, which to me is one of the best indicators if not the best. Trading on the 1hr time frame can be very stable as the trend takes hours before a change in the direction can occur. This strategy however places its decision based on the trend and in doing so you always trade in the direction of the trend . This is very crucial. From experience, when you trade in the direction of the trend, losses are reduced to minimal and even in the case of anomalies you realize that you quickly recover because you are in the same direction as the trend. 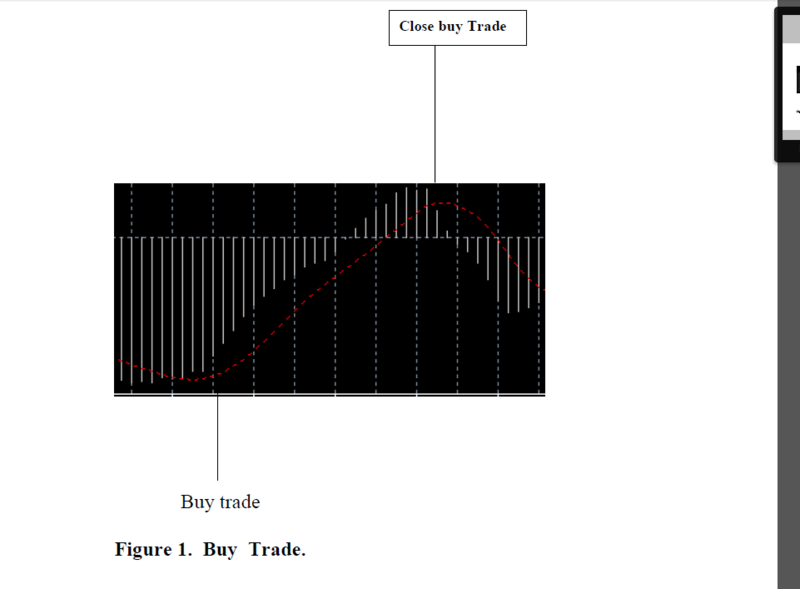 The most important aspect is where to enter a trade whether buy or sell trade as well as closing the trades. Using the MACD Scalping System, you enter a trade when the red line of the MACD indicator leaves the cloud and starts heading towards the centre line and close the trade when the red line starts to turn . Example of a buy and sell are shown by figure below. The The Trading System is made up of two parts. First, trading on the 1 hr chart and the other part is trading on the 1M chart. Trading on the 1hour chart is very steady as the trend goes on for hours. Using the above mentioned strategy demonstrated by the figures normally results in accumulation of high number of pips as you will see in the examples in the next section. To trade on the 1 hour chart you first open the MACD indicator (see setup section for instructions) and open the 1hour time frame. 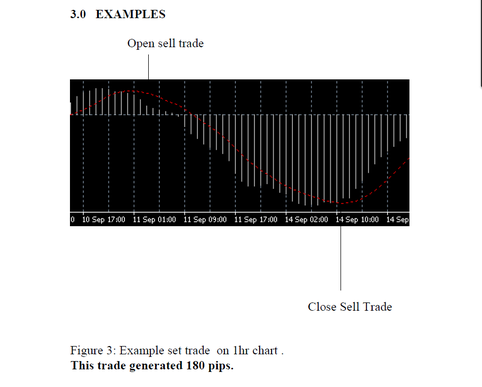 For buy trades, refer to figure 1 ie. You wait till the red line of the indicator leaves the cloud, you then launch the trade. The 1 hour cycle normally goes for hours so you wait ie monitor the trade till you see the red line turning. 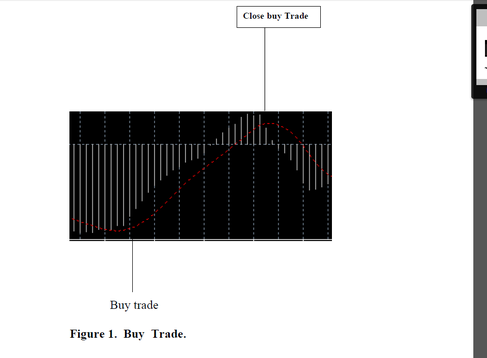 Once you sense a change in direction, you can close the trade as indicated the figure 1. Since the 1hr trend goes on for hours, I normally use 120-150 stop loss. For sell trades, refer to figure 2 ie. You wait till the red line of the indicator leaves the cloud, you then launch the trade Like the buy trade, once you sense a change in direction, you can close the trade as indicated the figure 2. It is important to note that when the red line leaves the cloud completely they normally heads to the centre line. See from the examples in the next section , this short cycle generated over 180 pips and this only represent the first part of the strategy. Most people from my experience do not like to trade on the 1m chart because it can be frustrating. Believe me, that’s where I do accumulate most pips. Most pips can be accumulated on this time frame if you really follow MACD Scalping System. Trading on the 1m chart is quiet different from the 1hr chart due to high volatility. One would have to be disciplined to be able to trade successfully on the 1m chart using MACD. We all know that it goes up and down quickly but this strategy recommends trading in the same direction as the 1hr chart o trend. 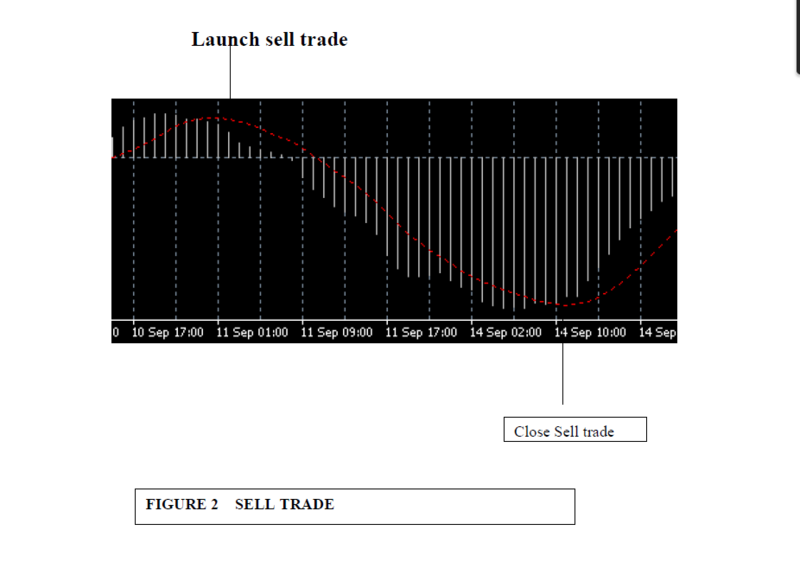 That is to say, when the 1hr trend is heading down you only executes sell trades based on the 1m chart using the entry and exit points demonstrated in figure 2 for sell trades. If the 1 hr is heading upwards ie buy trade, you only execute buy trades based on the 1m chart . For entry and exit points refer to figure1 . Stop loss is set 60 pips. I don’t recommend trading against the trend and this is an extremely important trading strategy. Most losses are incurred in trading against the trend. I don’t do it and I stay out of the chop. You make sure that the red line on the MACD indicator is in the same direction as the red line on the 1hr chart. Of course, pips can be made in trading against the trend but is a very dangerous move so I don’t recommend it. One average cycle should you anything between 20-40 pips. The 1m cycle normally takes about 20-30minutes to complete so it is therefore extremely important to monitor the trade and close it when it is appropriate. Let say for example, you are able to accumulate 20pips each cycle and you are able to execute 6 cycles, that should earn you cool 120 pips. This together with those from the 1hour trade should earn you well over 300 pips a day as demonstrated on particular trade. I have chosen one of my trades which I made over 300 pips within 24 hour period despite this being what can be described as a short cycle as indicated by the figure above. Firstly, a trade was placed based on the 1hr chart after spotting the redline leaving the cloud ( white lines) completely. As you can see from the figure above and in most cases, the redline heads towards the centre line. Making sure that the red line leaves the centre line is crucial as sometimes it appears to be leaving the cloud but do enter the cloud again. So it is very important that the red line is out of the cloud before launching a trade. After launching this trade based on the 1 hr chart, which was sell trade, the red line headed downwards. I closed the trade after it has descended through the centre line to the bottom half of the MACD indicator chart and was about to turn. That cycle accumulated over 180pips. Secondly, during the course of the day, I traded on the 1m chart. Since the 1hr chart was heading down,ie sell cycle, I executed sell trades whenever appropriate on the 1m chart and that resulted in the accumulation of between 20- 40 pips per cycle. In all, I made over 300 pips within 24 hour period. However, my preffered currency pairs are GNP/JPY, USD/JPY and EUR/JPY. These pips were made on GBP/JPY so one can imagine the amount of pips I could have made if I traded on USD/JPY and EUR/JPY. My preference to these pairs is due to high volatility.